Miss Print: Craftsy Block of the Month Tour + Giveaway! I am doing my first ever BOM right now and just got the first month's package yesterday. It is Merry Merry Snowman by Bunny Hills designs. I am doing the Craftsy BOM. :) Amy's instruction is fantastic btw. This is also my first BOM, although I have done quilt alongs where each block was slightly different (Clover and Violet Embroidery 101 for one). Thanks for the chance to win! I have never done a BOM before, but this may well be my first one! I love the asterisk block, and I love the idea of being able to see how it is made. I am just finishing up my last month of a BOM at my LQS. I don't think I will do another from a LQS. I hope it's ok that it wasn't an online BOM? I too have never participated in a BOM. :) Sounds like fun though! Thanks for the chance to win! I have never done a quilt along but it sounds like fun. In fact, my husband and I are planning on doing this once we get moved. I have been following along as best as I can. Will have to get home computer up and running by May. Everyone's blocks are beautiful. Here's hopping to win. I joined the craftsy BOM but haven't gotten past opening the first set of instructions... maybe this weekend will finally be the day! This is my first BOM attempt. My first ever BOM is Amy's on Craftsy! I am amazed at how huge it is, but Amy is awesome, so I guess it isn't surprising! Thanks so much! I'm a follower of your blog. Thanks again! I've never done a BOM - I kinda feel I'd never keep up then it wouldn't get finished!! I am doing the Craftsy BOM. While not my 1st BOM, it is my 1st modern one. I am enjoying the different blocks. I am participating in a BOM with my local quilt shop. I am going to look at the Blogger's Block-a-Palooza and FWQAL I didn't know about them until today. I am participating in the Craftsy BOM, I am using Christmas fabric. I just started following your blog, I love the picture of you sleeping with fabric. I never joined any BOM. I think this is my first time. I think follow the instructions through a video is very helpful. I'm quilting along w/ Amy Gibson and the BOM on Craftsy. I'm participating in the Sew Happy Geek quilt-along right now it is my first quilt-along and I'm really enjoying it. I will definitely join another quilt-along when it finishes. The craftsy bom is my first and I find the presenter very easy to follow. I am new to machine patchwork, rotary cutting etc. I am also on day 12 of Temecula's (I know I've spelt that wrong) pattern. I'm a follower!! Thanks for the chance to win!! I participated in the Simple Sampler Quilt-Along at Amy's Creative Side, and liked it so much I used to it teach simple piecing skills to the ladies in my sewing group! So far, I'm not doing this quilt along, but that's only because I've got too much on my plate to add anything else right now! Looks like fun, though! I'm doing the craftsty BOM club and have completed the blocks for January and February, it's my first attempt at anything like it, Amy is a great teacher :). I love your blog and I will defiantly be back!!! I'm new to the internet quilting world but i've done a couple of block of the month quilts. I will definitely follow your blog. I've never done a BOM or participated in a QAL while they are going on, but I have taken inspiration from the images posted by the blogger or the other participants after the fact! WEll I just found out about this block of the month, so I am no currently participating. I do have lots of quilt projects going though... does that count? I've never done a BOM- after adding up the entire program plus S&H, it's always waaaaaaaay more than I feel comfortable spending. There haven't been any that I covet enough to spend that much. I usually want to change the fabrics they're using, too, but that's not an option. I just did my first quilt along online online, though, which was a very fun experience. I wish BOM's had a pattern-only option- then I probably would bite the bullet, since I could use my fabric choices (or stash) and not feel like I just blew 2 student loan payments. I am also a follower. Thanks for the chance to win! I'll have to go back and check out the Craftsy BOM. I have done a block series before. I loved it. want to do more. I do a bom with my local quilt shop called the saturday sampler. I love it. the only thing I would change is that I would have them give out slightly more fabric than we get , cause there is no room for error with the current amount. 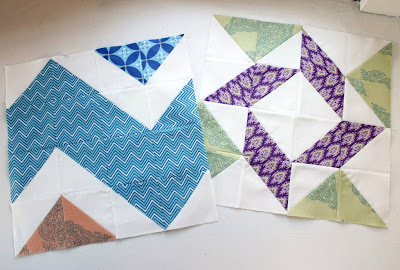 I did the Block-a-palooza & the Patchwork Squared QAL last year & really enjoyed them. It didn't bother me to not know what was coming up and in both, I loved all but 1 block in each. Why are these words that blogger uses so hard now! 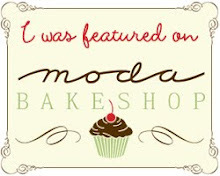 I'm a follower-I think I found your blog during Block-a-palooza! I haven't done any block of he months. I'm pretty new to quilting still. I have several online ones bookmarked for when I have fewer wips and more confidence, though! I'm brand new to learning how to quilt and jumped right in. I've done all 4 for Craftsy, joined Sew.Happy.Geek and Fresh Lemons Quilt for the BOM. So much fun! I'm a brand new follower. Can't wait to check it out. Thanks! I am participating in Amy Gibson's Craftsy block of the month program. I love the tutorials and they are amazingly easy to follow. I have done many block of the month quilts, from LQSs, and local quilt guild. I have completed 3 of the 4 Craftsy BoM. It is so exciting to learn a new technique everyday! Following your blog! Very inspirational! I participated in the Schnibbles QAL, but lost steam when we PCS'ed, and I did the Pinwheel QAL. I had fun with both! I am doing the Craftsy BOM. It is so fun! Amy Gibson rocks as a teacher. My sister and I are doing the course together and we are loving it. My first several quilts were sampler blocks/BOMs but I never quite liked the business of them. I prefer a more defined look to my quilts so don't do those types of QALs any more. I do the other types though, esp if it's a new to me technique or concept. This will be my first sew along -just been quilting over a year and anxous to learn proper techniques. Nope I never have. Just learning to sew. The first BOM I did was Bunny Hill's Snowbound and loved it! I am also participating in the Craftsy BOM and loving it! I'm fairly new to quilting so I'm learning some interesting techniques. I am a follower. I have been doing a BOM program through my LQS. I have never done a BOM sort of a thing before. I guess partly because the purchase of all the material for it isn't the way I sew. If it were blocks that were random and could use my scraps i think I could do it. I think the accountability would be good for me to finish something along with others. Thanks so much for your great blog and for the giveaway! I have never done a BOM course because I was a little too intimidated to join up. But the Craftsy one seems very manageable! I may have to see if I can catch up and join in the fun! Thanks for the introduction and the chance to win. I am a happy follower of your blog - Thanks!! I'm doing Craftsy's BOM. This is my first and I'm loving it! I've never participated in a BOM before, but I think it can be a good way to learn new techniques for a beginner like me. I haven't participated in a BOM yet being a new quilter, but I am signed up for the Craftsy class and I'm enjoying seeing the blocks. I definitely want to make some of them. I did a BOM with a nearby fabric shop. Each month the fabric and pattern were mailed to me. Fun.... Yes, I plan to follow the Craftsy BOM. Yes, I will follow your blog. I've never done a BOM, but this may be the year! I joined in one a couple years ago, and it was a lot of fun! The craftsy online classes are so great. This is my first BOM and the explanations from Amy are wonderfull and easy to understand. I'm from germany. I'm following along with the craftsy BOM as well, but like you haven't made any of the blocks yet. I have too many other things on the go!! I also recently participated in the Sparkle QAL which was a lot of fun, though I felt like the instructions came out too slowly and I had to wait a lot. Call me impatient. It was fun though! I am trying the Craftsy BOM videos. I love this format because I can choose my own fabrics and don't have to worry about international shipping costs each month. And I love the access to help from Amy and the other participants. Great way to get back into quilting! I now have your blog on my favourites list thanks to Craftsy! I am really happy to find your blog. I just started following you. I am participating in the Craftsy BOM. It is the first one I have ever done and I love it. I did a BOM at a quilt shop and I enjoyed it. I've signed up for this M but haven't started my blocks yet. I am participating in BOM and can not wait till the march blocks become available!! The Cratsy BOM is my first. I am loving it. I am also doing 1/2 Square Triangle BOM with In Color Order. It's almost March 1!!! Yes I am doing the BOM, I just finished the Balkan Puzzle last night! I've done several BOMs at my LQS and really enjoyed them. Thanks for the giveaway! This is my first quilt along/BOM project. I am failry new to quilting and am so excited bout learning new techniques! I am a brand new quilter and I'm participating in two BOMs. One is the Craftsy BOM. I've only watched the intro and the January episodes so far. The other is a BOM from my local quilt shop, Park Bench. The BOM I'm doing locally is called Amish with a Twist. A friend and I are starting when she gets back from a out-of-town job assignment. I'm really looking forward to trying my hand at quilting! I have been a follower! I am participating in Craftsy current BOM and I am really enjoying it. I also have been involved in other BOM via Eons Quilter Passion Group, 2 different challenge BOMs. One quilt is now completed and one is waiting to be quilted. I've never done a BOM being fairly new to the quilting Internet community but might try it sometime. I have hosted block of the months twice before but have never been a participant until now. I am participating in the Craftsy BOM and just love the idea of taking a big project in small bites. Thanks for the chance to win! I'm doing the craftsy BOM right now! I haven't dona a BOM yet, mostly because I have a bit of craft ADD and am afraid I won't finish what I start. i am currently participating in the craftsy BOM although i gotta do februarys blocks yet.....bit behind. The Craftsy BOM is my first BOM endeavor. I've wanted to quilt for years, and loving that I'm finally here. Kaye - I'm a new follower to your blog. Loving it so far. I've never done a BOM before but it is on my list of things to try soon. With three young kids i don't have lots of sewing time right now. I am participating in the FWQAL, I am enjoying every minute of it!. I love to check on everybody progress. Thank you for the chance! I'm doing the Farmer's Wife quilt along right now, but at my own speed. I'm really enjoying it and I can't wait to see what my blocks look like all together. I'm also doing the Craftsy BOM, but I haven't started my blocks yet. I've done several QALs. Currently I'm following along with two - one is a weekly installment and the other is every other week. I think they are great skill builders. I've not yet done a block a long. I have already signed up with the Crafty's BOM, but I haven't watched the videos yet. I have never done a block of the month! thanks! I am doing my second BOM right now and I love it - it is a Kaffe Fasset inspired BOM. I am participating in the Craftsy BOM and enjoying it very much. I haven't yet participated in a block of the month so the Craftsy BOM will be my first. I am participating in the Craftsy BOM. I have never been involved in a quilt-a long before because I am a newer quilter. The videos are easy to follow and I am looking forward to completed all parts of the quilt by the end of the year! This is the first online block of the month that I have participated in and I am most excited. 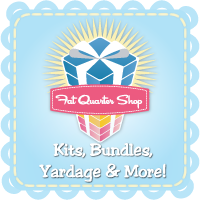 I too am yet to start, but I am about to order the fat quarter bundle that I really want to use. The other block of the month project I have participated in before was through my local patchwork and quilting store and we all visited once a month for a demonstration of one or two blocks. I have also got all of the things aside for a fundraising quilt which is BOM for Ovarian Cancer. I am doing the Craftsy BOM and have completed the January blocks. February has been a trying month and I haven't done those yet. Love the ability to go back and watch the instructions again and to print out. I am new to visiting your blog but I'm really looking forward to following you. My blog is very much in its infant stages and I am keen to look at the blogs of other crafters to see what people are interested in reading.Your tour post is great! I'm participating in the Craftsy BOM! I have participated in blocks of the month several times. I love doing it! Haven't been a follower of your blog, but will be now that I've discovered you! I have followed a few other BOM's in the past but didn't feel comfortable enough yet in my skills to do any of them. I did start following Amy's BOM on Craftsy though and am very much hoping to get some of them completed. (too many family things in the past month so I haven't had the chance to start any of them yet). I have never done a block of the month but would like to try one. I participate in the BOM. January is done and February nearly half done! I am a novice quilter and I love how easy it is to follow the instructions. I am doing the craftsy block of the month and love it! I love the fact I can "replay" to look at techniques, versus bom that I have done at sewing shops, I can always go back to Amy's video! Yes, I participated in a Quilt Along at PS I Quilt blog, it was a postage stamp quilt along and I made a king sized postage stamp quilt, it was my 1st quilt along. I have never participated in a BOM - yet. But I would love to, I like going along at a slow pace but not too slow because then I will get sidetracked by wanting to start another project. Yes Im a follower to Miss Print on Facebook too! I never have participated in a BOM or other type of block-making quilt-along. I expect I will someday though. 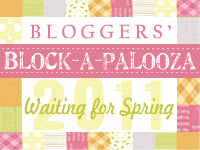 Bloggers Block a Palooza was my very first QAL. Also did LMS Birdie Stitches and the P2 Modern, and Uberfest. It was great fun and my first lessons in making flying geese. I'm doing the craftsy bom. Super fun! I'm having a great time with the BOM with Amy ... with her help I am getting past making nothing but little blocks ... I hope there are more of these next year! I am doing the Craftsy BOM. I have done Saturday Sampler BOMs at the LQS in the past. I just discovered your blog and about the BOM. May have to give this one a shot, sounds like fun. Like the idea that I can play catch up! Thank you! I'm Craftsy BOMing, my first BOM. As a beginner, having to complete only two blocks a month gives me time to make and fix lots of mistakes! I have not participated in a BOM but this looks interesting! Doing the crafty Bom! Loving it. Now following you! Yes, I did the Block-a-Palooza and others, too. I just might do this one, but I'd have to go to the library to get fast speed to watch the video. I'd love to enter your giveaway. I am Doing the BOM from Amy and love it so far. I have done BOMs at my LQS as well as a mystery quilt there. Always fun! I have participated in several BOM'S over the last 5 years. I really love doing BOM'S because I always learn something. Yes I am doing Craftsy BOM and have loved it so much I am doing 3 at a time. Yes am following your blog...love it. My first ever BOM is the Craftsy bom. I started out great and then was gone for over 2 weeks for the second set of blocks, so I am already falling behind. But unless I get waylaid again, this will also be my very first quilt!! at the age of 60...or 61 by the time we get to the end. I'm doing the Craftsy BOM with my 2 daughters, 10 and 13. We love Amy! I have never participated in a BOM or ever even quilted before. I joined the Craftsy BOM in January and am loving it so far! I'm doing the Craftsy BOM. I really enjoy looking at all the pics uploaded by others. The variety is amazing. I must say, I'm looking forward to the first of each month! I've never done a BOM . . . I've always had so many of my own projects going on that it has never crossed my mind. I'll have to check this one out. Thanks for the chance. Last summer I did the Summer Sampler QAL and I did Amy's Creative Side's Simple Sampler. I am new to Blog and a new follower as well. I've done block of the months through my Quilt Guild, but I'm pretty bad at getting my blocks done. I decided to join the Craftsy Block of the Month after seeing a lot of cut blocks posted there, plus thought it might be interesting - so far I'm loving it, and am learning new things (after 25 years of quilting!). I am participating in the Craftsy BOM and having a lot of fun. I'm anxious to see what the March blocs will be!! I joined Craftsy Block of the Month to see what I can learn. I am fairly new to quilting, but have been sewing garments and other items for a number of years. I love Amys videos, and am learning quite a bit. I am signed up for the craftsy BOM! I ordered my fat quarter bundle last month and have watched some of the video. Love it so far! I am a follower of your Facebook blog updates! I'm doing the Craftsy BOM - it's my first BOM, and I'm loving it SO much. I've done all the blocks from January and February, and I'm so pleased with them. Can't wait for March 1st!